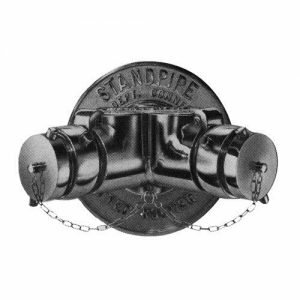 The Fire Department Connection (FDC), also known as the Siamese Connection, is an important component found on most sprinkler and standpipe systems. 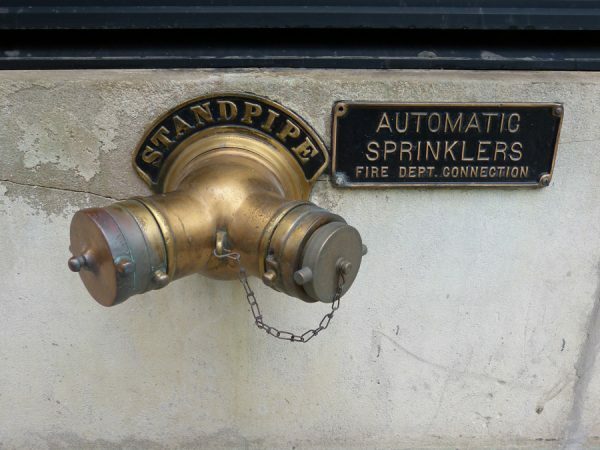 When a sprinkler system activates, the fire department connects hose lines from a pumper truck to the fire department connection. 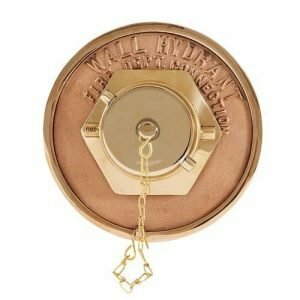 FDCs are required on nearly all sprinkler systems installed to National Fire Protection Association (NFPA) 13, Standard for the Installation of Sprinkler Systems, 2007 and 2010 editions, and NFPA 13R, Standard for the Installation of Sprinkler Systems in Residential Occupancies Up to and Including Four Stories in Height, 2007 and 2010 editions. 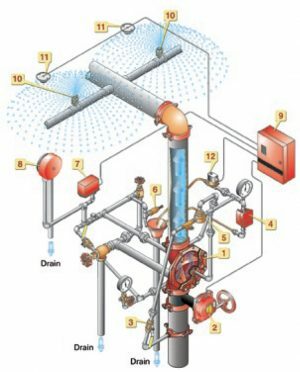 The FDC is intended to provide sprinkler systems with a means to receive supplemental water support from fire department pumping apparatus. 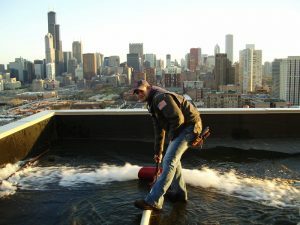 In cases where buildings have been shut down or abandoned, we often find the utility water service removed even though such removal is generally prohibited in the model fire codes. Events such as floods, hurricanes, tornadoes, earthquakes, and similar events can interrupt utility-provided water either because of loss of power to pumping stations or damage to the water supply infrastructure piping. If these events were to interrupt the automatic water supply to a sprinkler system, then the only possibility of providing water to the sprinkler would be through the FDC. Fire departments are generally able to provide water supplies through tankers, shuttles, and drafting during such events long before the utility system is restored. 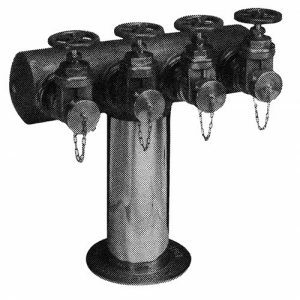 Product Function: Used as an auxiliary inlet connection, providing a minimum 500 Gallons per Minutes (1892 Liters per Minutes) (Ref. NFPA 14) to supplement the fire protection water supply. Swing clapper provides unobstructed waterway. Exposed design is an economical method of satisfying fire dept. inlet requirements. 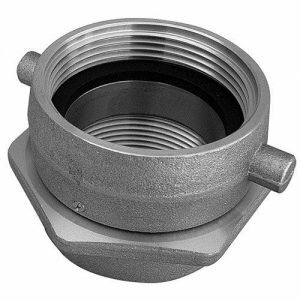 Product Function: Used as an auxiliary inlet connection, providing 500 GPM/1892 lpm minimum (Ref. NFPA 14) to supplement the fire protection water supply. Drop clappers provide unobstructed waterway. 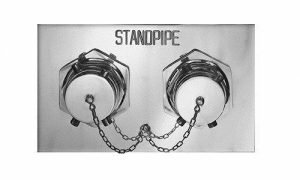 Exposed design is an economical method of satisfying fire dept inlet requirements. Regularly Furnished: Cast brass two-way inlet body, drop clappers and pin lug swivels. Size and outlet as selected by model number. Lettering as selected. 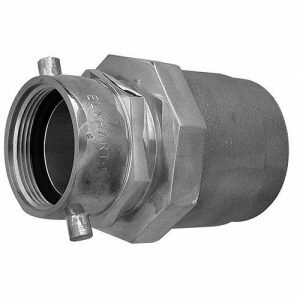 Product Function: Used as an auxiliary inlet connection, providing 750 GPM/2839 lpm minimum (Ref. NFPA 14) to supplement the fire protection water supply. Drop clappers provide unobstructed waterway. Exposed design feature is an economical method of satisfying fire dept. inlet connections. Regularly Furnished: Cast brass three-way inlet body, drop clappers and pin lug swivels. Size and outlet location as selected by model number. Lettering as selected. 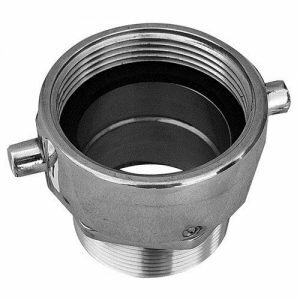 Product Function: Used as an auxiliary inlet connection, providing 500 GPM/1892 lpm minimum (Ref. NFPA 14) to supplement the fire protection water supply. Drop clappers provide unobstructed waterway. 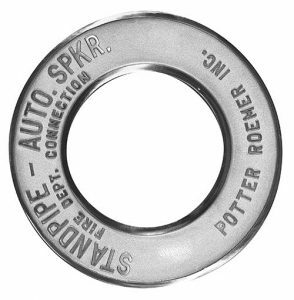 Plate identifies and enhances appearance of inlet connection. 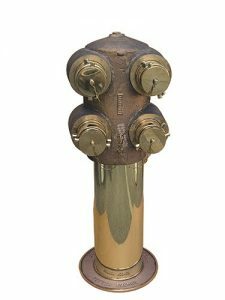 Regularly Furnished: Cast brass two-way inlet body with drop clappers, pin lug swivels and plugs and chains. Cast brass round wall plate with lettering as selected. Outlet and inlet size as selected by model number. 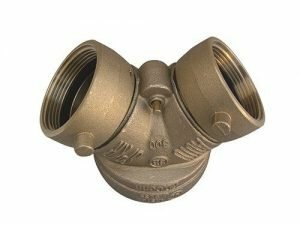 Product Function: Used as an auxiliary inlet connection to supplement the fire protection water supply. Provides unobstructed waterway. Flush design desirable when appearance is a factor. Regularly Furnished: Brass plate with lettering as selected. Polished brass snoot with rigid end NPT x pin lug hose thread swivel, pin lug plug and chain. Round or square plate; size as selected by model number. 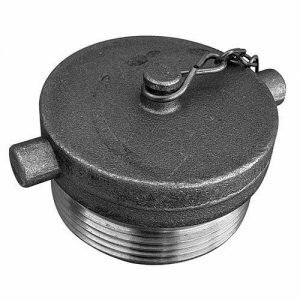 Product Function: Used as an auxiliary inlet connection to supplement the fire protection water supply. Drop clappers provide unobstructed waterway. Flush design desirable when appearance is a factor. Regularly Furnished: Cast brass body with drop clappers. Size, outlet location and number of inlets as selected by model number. Polished brass plate with lettering as selected. Polished brass 2.5 inch (6.4 cm) double female snoots with rigid end NPT x pin lug hose thread swivels, pin lug plugs and chains. Regularly Furnished: Cast brass body with drop clappers. Size, outlet location and number of inlets as selected by model number. Polished brass plate with lettering as selected. Polished brass 2.5 inch (6.4 cm) triple female snoots with rigid end NPT x pin lug hose thread swivels, pin lug plugs and chains. 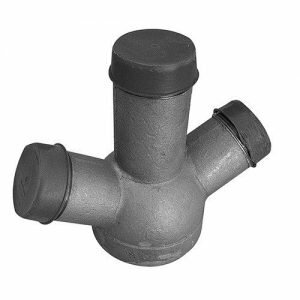 Cast brass or ductile iron (thermally-fused red polyester coated) body. Type and size of outlet and number of inlets as selected by model number. Polished brass plate with lettering as selected. 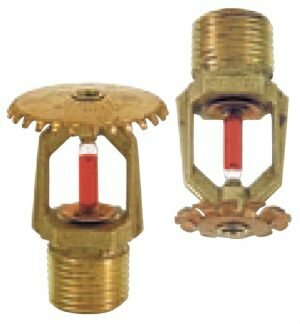 U/L listed polished brass double female clapper snoots with rigid end 3 inches (76.2 cm) NPT x 2.5 inches (6.4 cm) pin lug hose thread swivels, pin lug plugs and chains. 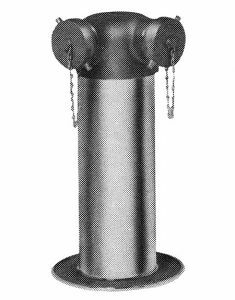 Product Function: Used as an auxiliary inlet connection to supplement the fire protection water supply. Free-standing design is used on exterior fire lines piped vertically through grade. Regularly Furnished: Cast brass angle body or red glossy polyester coated ductile iron angle body, size of outlet and number and type of inlets as selected by model number. 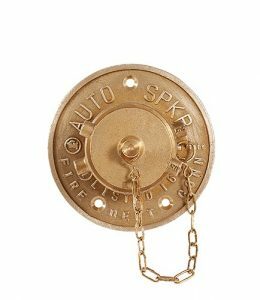 18”/45.7 cm long polished brass cover sleeve; cast brass identification base plate, cast brass pin lug plugs and chains on each pin lug swivel. 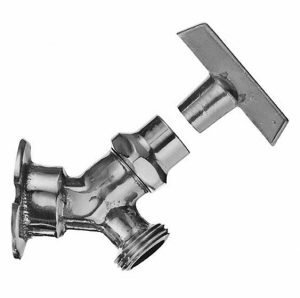 Product Function: Used as an auxiliary inlet connection to supplement the fire protection water supply. A Storz connection provides a means of rapid supply through large diameter hose (LDH). 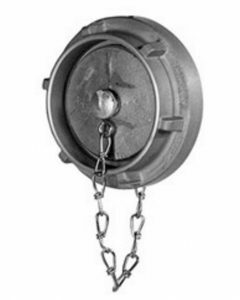 Compliant with NFPA 1963 requirements. Regularly Furnished: Hard coated aluminum with Storz on one end and female national pipe thread on the other. 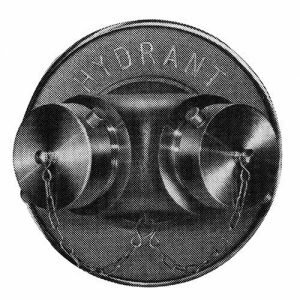 Product Function: Used as an auxiliary water supply by the fire service. Single outlet suitable when water demand is under 500 GPM/1892 lpm (Ref. NFPA 20). Flush design desirable, when appearance is a factor. Regularly Furnished: Polished brass plate lettered HYDRANT. Female NPT x male hose thread snoot with cap and chain. Round or square plate and size as selected by Model Number. 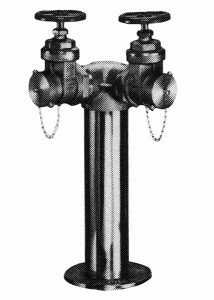 Product Function: Used as an auxiliary water supply by the fire service, flush design desirable when appearance is a factor. Two-way outlet suitable when water demand is under 750 GPM/2839 lpm, three-way is suitable when water is under 1000 GPM/3785 lpm Ref. 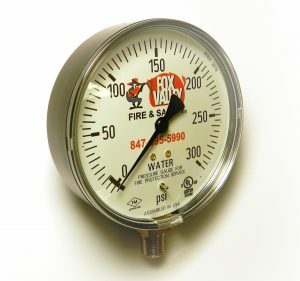 NFPA 20. Regularly Furnished: Brass body and polished brass plate lettered HYDRANT polished brass female NPT x male hose thread snoots with caps and chains. Number of snoots, size and inlet location as selected by model number. 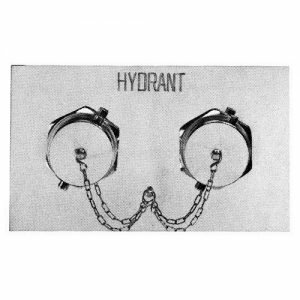 Product Function: Used as an auxiliary water supply by the fire service. Two-way outlet suitable when water demand is under 750 GPM/2839 lpm, three-way outlet suitable when water demand is under 1000 GPM/3785 lpm. Regularly Furnished: Cast brass back outlet body with caps and chains. 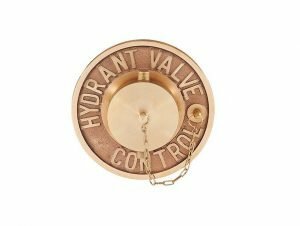 Cast brass round wall plate lettered HYDRANT, inlet size and number of outlets as selected by Model Number. 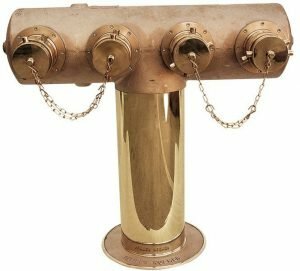 Regularly Furnished: Cast brass back angle body with male hose threads with caps and chains. 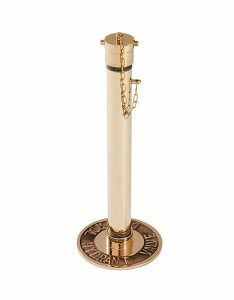 18”/45.7cm long polished brass cover sleeve and cast brass plate lettered HYDRANT, inlet size and number of outlets as selected by Model Number. 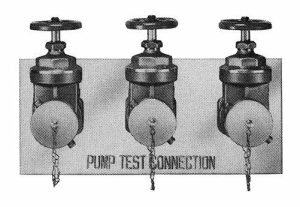 Product Function: Used to control a remote, non-rising stem valve that supplies hydrants or test connections. 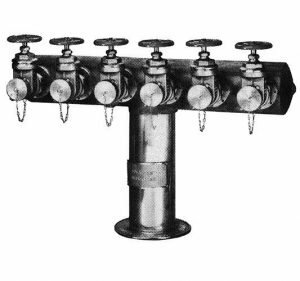 Regularly Furnished: Polished brass 7”/17.8 cm plate lettered HYDRANT VALVE CONTROL threaded 11/2”/3.8 cm female NPT on back and 21/2”/6.4 cm NST male on front with cap and chain. 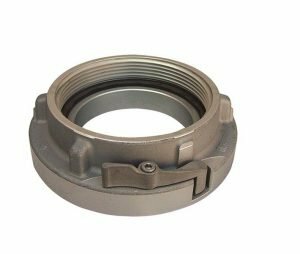 Rough brass 11/2”/3.8 cm NPT lock nut, 18”/45.7 cm long x 7/8”/2.2 cm square steel extension rod, with coupling for attachment to stem of gate valve. 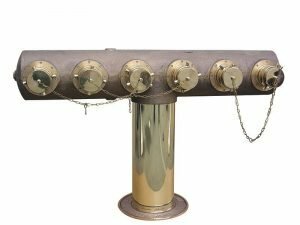 Regularly Furnished: Polished brass round base plate lettered HYDRANT VALVE CONTROL threaded 11/2”/3.8 cm x 16”/40.6 cm long polished brass cover sleeve and cap chain. 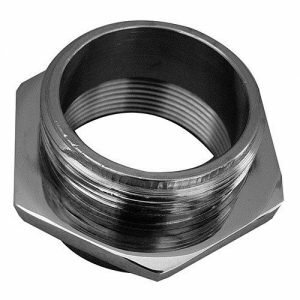 Rough brass 11/2”/3.8 cm NPT lock nut, 30”/76.2 cm long x 7/8”/2.2 cm square steel extension rod, with coupling for attachment to stem of below-grade gate valve. 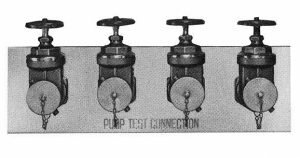 Product Function: Used to test flow capacity of fire pumps. Each outlet capable of a minimum flow of 250 GPM/946 lpm. Gate valves provide unrestricted waterway and control of individual outlets (Ref. NFPA 20). Regularly Furnished: Cast brass body with end inlet, size and number of outlets as selected by model number. 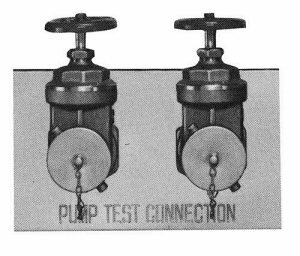 Brass plate lettered “PUMP TEST CONNECTION”. 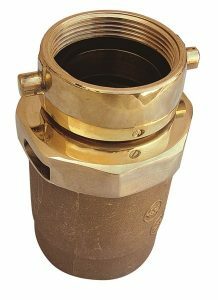 Brass NRS hose gate valves are supplied, with every other valve having a loose bonnet, as required for installation. 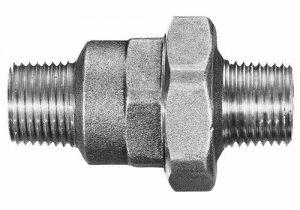 3”/7.6 cm female NPT inlet x 21/2”/6.4 cm male hose thread outlet, with caps and chains. 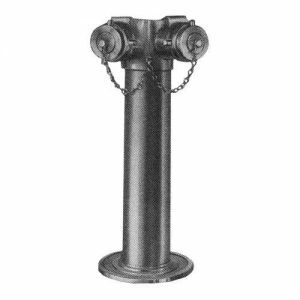 Product Function: Used as a standpipe roof outlet connection by the fire service. 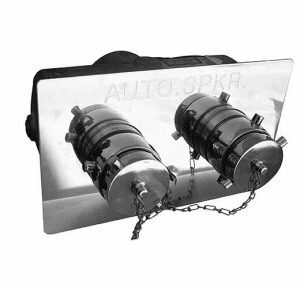 Provides 250 GPM/946 lpm minimum per outlet (Ref. NFPA 14). 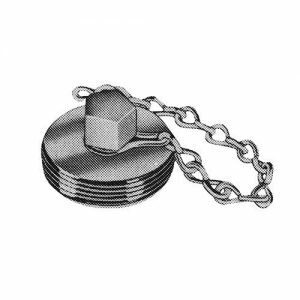 Used with straight or angle hose valves to provide water control. 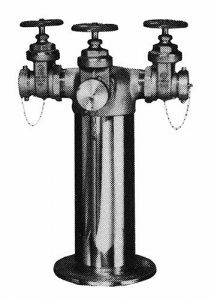 Refer to Section 4000 for valve selection. Regularly Furnished: Cast brass body with female NPT inlet and male NPT outlets. Type and size of inlet and number of outlets as selected by Model Number. 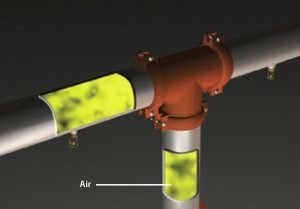 Product Function: Protects fire department connections from trash, contamination and vandalism – events that render the FDC useless and could result in loss of life and property. 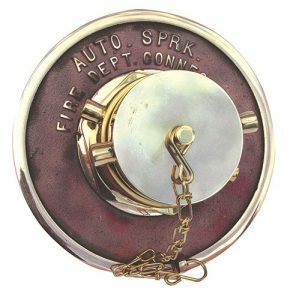 It’s easily identifiable design lets the fire department know that the connection has not been tampered with. 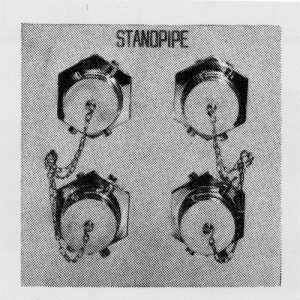 It is easily removable by the fire department using standard equipment. 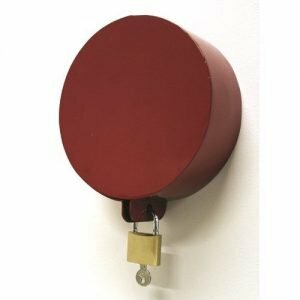 Regularly Furnished: Cap is constructed of heavy gage steel, painted red or plated. 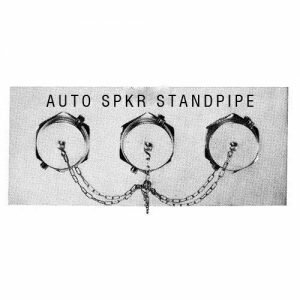 Product Function: Used to connect fire hose to a standpipe or sprinkler system. 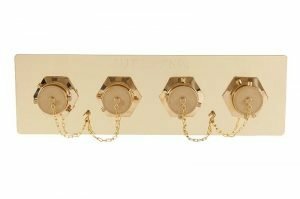 Regularly Furnished: Cast brass connection with size and type of inlet and outlet as selected by Model Number. Polished brass exposed parts. 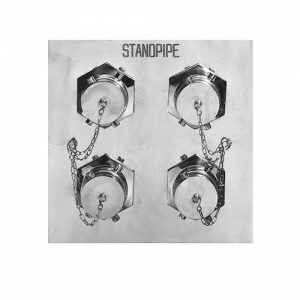 Product Function: Used to connect fire hose on multiple inlet fire dept. connections. Acts as a check against an excess backflow of water. 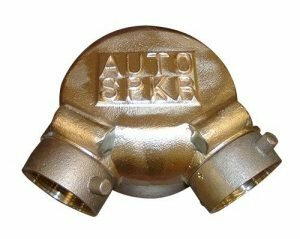 Product Function: Used to connect fire hose on multiple inlet fire dept connections. Acts as a check against an excess backflow of water. 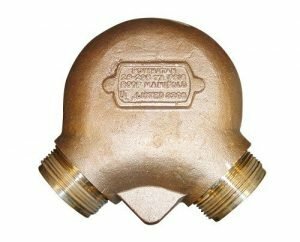 Product Function: Used on fire dept inlet connections. Discourages entry of foreign matter and protects female threads. Product Function: Used on fire dept. inlet connections. Discourages entry of foreign matter and protects female threads. Breakable feature allows fast hose hook-up. 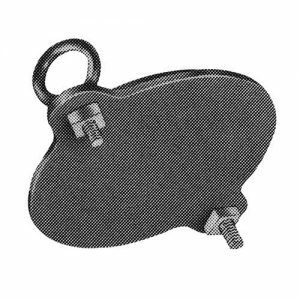 Regularly Furnished: Aluminum cover with breakable ears; two eye bolts and nuts for attachment to female pin lug swivel. 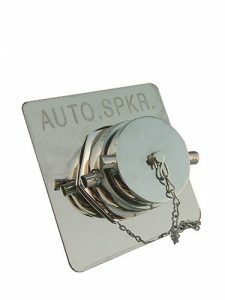 Product Function: Used to identify and trim exposed fire dept connection installations. Regularly Furnished: Brass or red finish aluminum plate, size and material as selected by Model Number. Lettering as selected. Product Function: Used with fire dept. connections for identification. Regularly Furnished: 4 x 8”/10.2 cm x 20.4 cm brass or red finish aluminum plate, material as selected by Model Number. Lettering as selected. 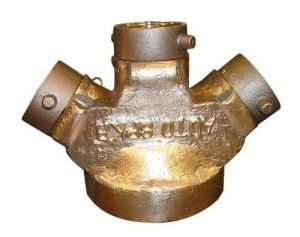 Product Function: Used to drain low point of system between fire dept connection and swing check valve. Seals automatically under pressure. Installed in horizontal position only. Regularly Furnished: Cast brass angle or straight connection, male NPT both ends. Size and design as selected by Model Number. 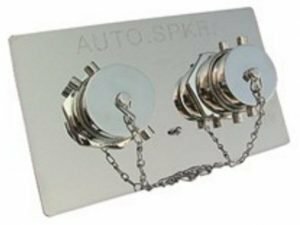 Product Function: Used to manually drain low point of system between fire dept. connection and swing check valves. Regularly Furnished: Polished brass flanged sillcock with 3/4”/1.9 cm female NPT inlet x male GHT; stem shield and removable tee handle key.